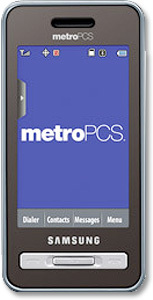 Without any contract tie up, the wireless communications service provider MetroPCS Communications Inc offers users a deal to purchase the new high-end Samsung Finesse phone at $349. This full touch-screen mobile device offers a 2-megapixel camera with video capture, QWERTY Keyboard, numeric dialpad, 150MB built-in memory with optional MicroSD expansion slot, MP3 music player and 262,000 color display. The Samsung Finesse supports 3G data networks, full HTML browser, besides being GPS ready and bluetooth enabled. Some users might be of the opinion that $349 is probably a bit costly even for a contract-free high-end smart phone. But this depends on individual opinion. Users can grab this offer online though a few weeks’ wait is required for the model to be ready for shipping.